Angelin Chang, Professor of Law and Professor of Music (Piano), will perform a Keyboard Area Concert Extravaganza on Friday 2/15/19, at 7pm in the CSU Drinko Recital Hall. The Concert is free and open to the public. With C|M|Law, Professor Chang teaches Representing the Musical Artist, and has served on the faculty of the Great Lakes Sports and Entertainment Law Academy. For information on sports and entertainment law resources, see the Law Library’s Sports and Entertainment Law Guide. 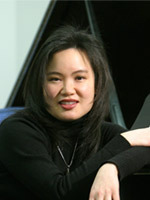 With the Department of Music, Professor Chang is also Coordinator of Keyboard Studies and Coordinator of Chamber Music. She received a 2006 Grammy for Best Classical Performance-Instrumental Soloist (with orchestra) for her recording of Olivier Messiaen’s Oiseaux Exotiques (Exotic Birds) with the Cleveland Chamber Symphony, conducted by John McLaughlin Williams.